Things I did not know until this overnight flight home to Scotland: borealis occurs all year, but it takes something with a more expansive spectrum (read: camera) to see it. Which is why we don’t, until that special time of year when it fluctuates. The more you know, huh? Talk about vivid. I had planned to save this gem for a bit, as it is one of many incredible pictures I took during my trek through the Midwest. Expect to see it again. I have stories. Maybe it’s Interstellar messing with my head, but this is what space travel looks like, right? I’m gonna go ahead and say yes, because why the hell not? Ha! Your photo is gorgeous, thank you for that!! PS God! IDK what I am doing in your house but every time you ask me I slide down the wall laughing! Nooo. Well, maybe? If you’re in the air, does it still count as “in”? 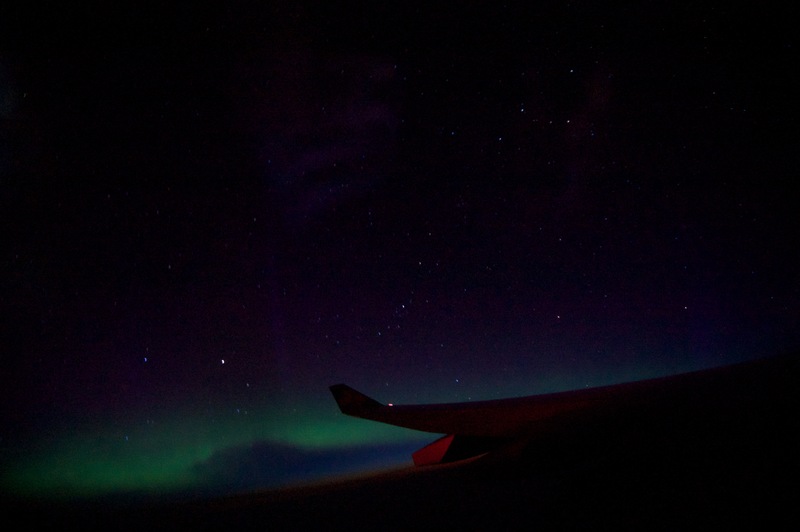 This was the flight home from my MW trek, so we might have been at the edges of Canadia, possibly nearer Greenlandia. I wouldn’t fret :) I’m sure if you go to the tippity-tipmost point of Michigan, up hill with no light-pollution, you’d succeed, provided it was that time of the year. The difference with this was that I couldn’t actually see the green haze, only my camera could. I genuinely thought it was broken, until I realised it was happening on every picture.